Valerie Nickerson is a dedicated real estate professional, passionate about providing remarkable service to buyers and sellers in residential estates and investment properties. Valerie Nickerson is a proud member of Berkshire Hathaway HomeServices California Properties, led by Warren Buffet the 'Guru of Real Estate'. 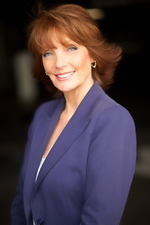 She is a member of the Beverly Hills-Los Angeles Board of Realtors®, California Association of Realtors®, the National Association of Realtors®, and the Beverly Hills Chamber of Commerce. Valerie greets her clients with confidence and warmth and assures them their interests will be handled professionally and timely. Her dedication is unwavering and her business practice is of the highest ethical standards. Valerie serves clients in Beverly Hills, Bel Air, West Hollywood, Brentwood, Pacific Palisades, Malibu, Westwood, and Century City. She represents both Buyers and Sellers with Single Family homes, Condominiums or Income properties. Please feel free to browse through my website and explore the West Side areas. You will find community information, consumer links, school information, free reports, answers to commonly asked real estate questions, and more. If you currently own property and are thinking of placing it on the market, sign up for a Free Home Evaluation and to receive Free Updated Daily Listings. My services don’t end there. I will work with you to develop a customized plan for marketing your home and successfully securing the home of your dreams. Many of my clients go beyond home ownership and acquire Real Estate, both commercial and residential, for their investment portfolio. Identifying opportunities and presenting them in a timely manner give my clients a competitive advantage. Many of my clients are celebrities and executives who appreciate their ability to work privately and discretely. Whether you are buying or selling a home, or securing investments for your portfolio, we would like to earn your business. I invite you to contact me today and schedule an appointment to discuss your specific Real Estate needs.